Outsourcing software development comes with quite pleasant advantages. An external company already have pre-qualified resources which are skilled in the particular IT domain that you require. Nearshore-Romania Development Center gathers experts formed on a large number of projects in the area, with long-time experience. This means no downtime as they have successful ready-made answers to potential domain-specific problems. Why waste time and money, when you have us? Hiring Nearshore-Romania pre-qualified team, you avoid costs resulting from training an in-house team and allows you to save time. Good speed-to-market is a must these days. Under Nearshore-Romania Development Center, you enjoy pre-qualified resources on a monthly basis at a controlled price. We aggregate and provide you with the best talent matching your needs. By contracting external resources for your one-time necessities, you avoid the unpleasant situation of having to hire people for a short time and then lay them off when the project has finished. You have the advantage of transferring the personnel management to the offshore company and letting them deal with the ups and downs of the project. Your local staff addresses more important and sensitive issues after you free them up from your legacy systems maintenance. 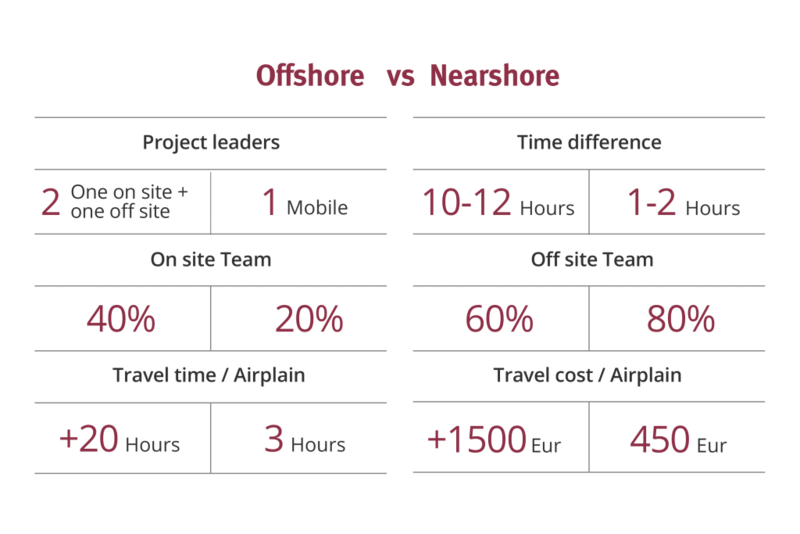 Technology platform and tooling conversions without overburdening your current staff; all you have to do is offshore your conversion projects. Completed projects despite a tight current timeframe if you move the overloading projects nearshore or offshore.